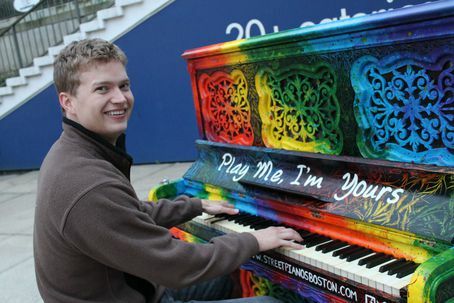 Piano decorated by Skye Schulte and donated by Louis Gentile. Thanks to Boston Properties. Terrific place to place a piano. The sound resonated off of the stone plaza. Please do this again next year. Without my wonderful J, I know that my life would also be a mistake! 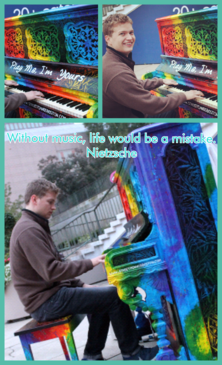 Here are some photos of him playing one of his favorite instruments. J, I am so in awe of you and everything that you do! Remember, “those who were seen dancing were thought to be insane by those who could not hear the music." I'm so happy that we both love & hear the music together. I love you - forever and always. 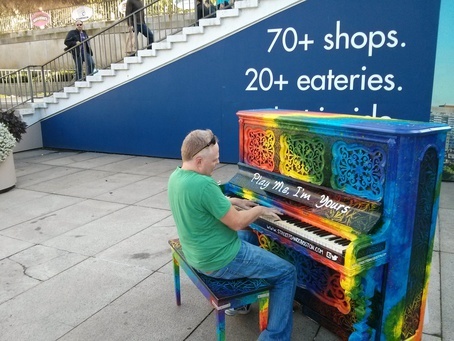 We found this wonderful piano in the early hours of the morning and what an amazing surprise it was. Here is a photo of the most incredible man that I know doing something that he absolutely loves. J, I am so proud of you and all of your unbelievable talents. You never cease to amaze me. I love you so much! Conservatory Lab Charter School's Dudamel Brass performing Billy Joel's "Piano Man, led by Chris Schroeder. El Sistema Program, visit conservatorylab.org.